The 22 dragonscale-shaped tokens indicate specific effects that adventures and dungeon denizens may fall victim to. 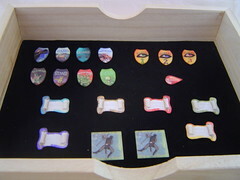 The scale-shaped tokens are all emblazoned with D&D artwork from Wizards of the Coast. The 18 scroll tokens act as handy reminders for status and ongoing damage effects. These scroll tokens are designed so the DM may mark them with a wet erase marker (available from any office supply or stationary store). The set also includes 5 drop-shaped Bloodied tokens and 5 corpse markers. The tokens are contained in a handsome wooden box. Inside, the box is divided into compartments to sort and store your tokens and any other items the Dungeon Master will be using; dice, pencils, miniatures or whatever! The lid of the box is lined with felt, turning it into the perfect dice tray to keep wild rolls under control. The back of the packaging gives you a clear picture of everything you’re getting in this accessory (minus the dice and dice bag, as noted). The set is contained within an 8in x 10in x 2in wooden box emblazoned with the Dungeons and Dragons logo. The inside of the lid is felt-covered to provide a rolling surface for dice. 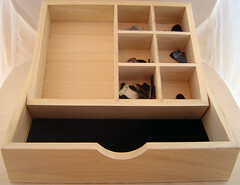 The bottom of the box is divided into six small compartments for the tokens and one large compartment for dice, pens, etc. The tokens themselves are high quality, each featuring artwork from Wizards of the Coast and a thin felt backing. The dragons scale shaped tokens mark the basic conditions in the game: grabbed (x2), slowed (x2), immobilized (x3), restrained (x2), weakened (x2), concealment (x2), stunned (x3), and dazed (x3). There are also three tokens for the marked condition, each highlighted in a different color (green, purple, and red) and featuring a “1”, “2”, or “3” identifier on them, so that different character’s marks can be distinguished. For status and ongoing damage, there are 18 scroll tokens. The status tokens come in blue, purple, and brown, and the ongoing damage tokens are green, red, and yellow. There are three each of every colored scroll token. These can be customized by marking them with a wet-erase pen. There are also 5 bloodied tokens, shaped like a small blood drop, and 5 square dead body tokens. The dead body tokens are, amusingly, ever so-slightly varied: some feature the body face down, others feature it face up. Unlike other token sets that are designed to stack underneath the miniatures, Gale Force Nine’s Dungeon Master’s Token Set is intended to sit at the base of the miniature. 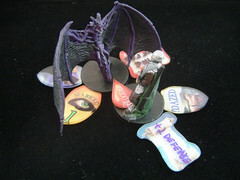 The small bloodied token can rest atop the miniature’s base, while the condition, status, and ongoing damage tokens are curved to nestle right up against them. This makes it easier to see what conditions are in play, but may clutter up the battlemap or prove less useful in cramped environments (i.e. 3D miniature terrain) or encounters with numerous minis involved. The Dungeon Master’s Token Set is available now at your local gaming store or favorite online retailer, and is priced between $20 and $30.